Water delivery via asteroids or comets is likely taking place in many other planetary systems, just as it happened on Earth, new research strongly suggests. Published by the Royal Astronomical Society and led by the University of Warwick, the research finds evidence for numerous planetary bodies, including asteroids and comets, containing large amounts of water. The research findings add further support to the possibility water can be delivered to Earth-like planets via such bodies to create a suitable environment for the formation of life. Commenting on the findings lead researcher Dr Roberto Raddi, of the University of Warwick's Astronomy and Astrophysics Group, said: "Our research has found that, rather than being unique, water-rich asteroids similar to those found in our Solar System appear to be frequent. Accordingly, many of planets may have contained a volume of water, comparable to that contained in the Earth. "It is believed that the Earth was initially dry, but our research strongly supports the view that the oceans we have today were created as a result of impacts by water-rich comets or asteroids". In observations obtained at the William Herschel Telescope in the Canary Islands, the University of Warwick astronomers detected a large quantity of hydrogen and oxygen in the atmosphere of a white dwarf (known as SDSS J1242+5226). 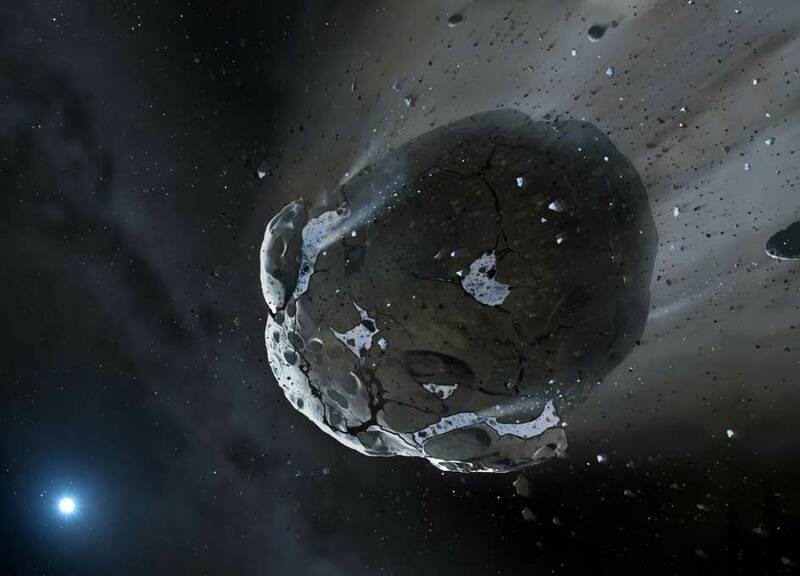 The quantities found provide the evidence that a water-rich exo-asteroid was disrupted and eventually delivered the water it contained onto the star. The asteroid, the researchers discovered, was comparable in size to Ceres - at 900km across, the largest asteroid in the Solar System. "The amount of water found SDSS J1242+5226 is equivalent to 30-35% of the oceans on Earth", explained Dr Raddi. The impact of water-rich asteroids or comets onto a planet or white dwarf results in the mixing of hydrogen and oxygen into the atmosphere. Both elements were detected in large amounts in SDSS J1242+5226. "Oxygen, which is a relatively heavy element, will sink deep down over time, and hence a while after the disruption event is over, it will no longer be visible. "In contrast, hydrogen is the lightest element; it will always remain floating near the surface of the white dwarf where it can easily be detected. There are many white dwarfs that hold large amounts of hydrogen in their atmospheres, and this new study suggests that this is evidence that water-rich asteroids or comets are common around other stars than the Sun". The research, Likely detection of water-rich asteroid debris in a metal-polluted white dwarf, is published in the Monthly Notices of the Royal Astronomical Society by Oxford University Press.